The scans are of poor quality but the information is very observable. 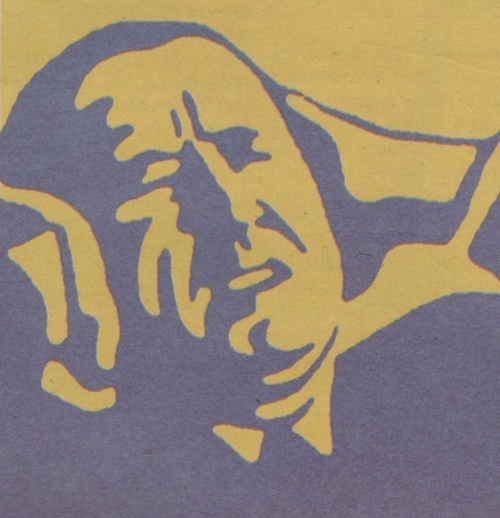 This is the Entire Set of his observations produced in the late 1930's and early 1940's. The Results, from Dr. Olsen in the late 1930's, show that any loudspeaker driver or driver array will benefit from a curved loudspeaker enclosure. This benefit will gain increased sound quality and sales in the marketplace. as obtained from laboratory experiments conducted by NACA and NASA. Shape B- Sphere, squished Shape C- Cylinder, center-mount These graphs are from experiments performed in 1950 at RCA's research labs at Princeton University. 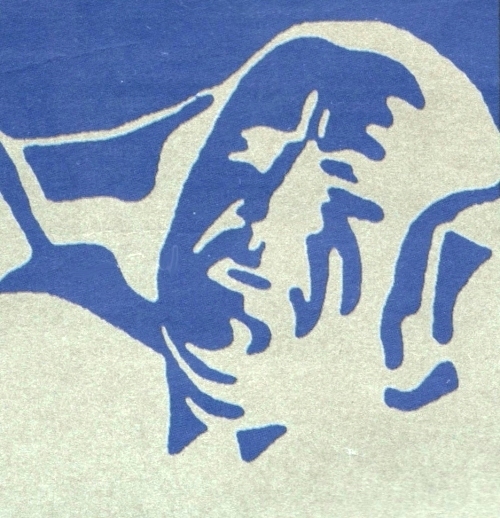 The driver used a sealed-back cabinet using the shapes as drawn by Dr. Olsen. What this means is that the responses you see here are caused ONLY by the Outer Shape of the Cabinet or Enclosure! Notice how Shape C, the Cylinder, generates a strong "ringing" or resonance pattern. Shape A (Sphere) has by far the least distortion of all shapes on Olsen's charts. Nothing approaches the Sphere's lack of cabinet distortion. Properly curved cabinet designs approach the Sphere. One would suspect these distortion patterns would appear, just from interior shape reflections back through the drivers cones-- given the cylindrical nature of ports, but it is interesting to see that the exterior effect apply as well as the data shows. 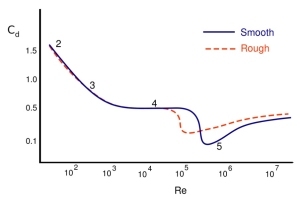 Also review Shape E's responses, the Cube - same high-resonance pattern. Not a desirable cabinet to reduce cabinet distortion! Here are more shapes with bad cabinet distortion- exterior effects are clearly in evidence based on Dr. Olsen's clean test methodology! Here are what most designers settle for, at best twiddling in the front baffle and driver placement. Helps a little but you can still see the bumps and dips compared to curved cabinets. 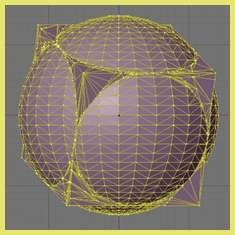 Even computerized processing cannot approach the natural strong, smooth, response that our spherical, ovoid, or wing-shaped enclosures easily provide with a great never before seen loudspeaker look similar to a lamp, a piece of curved art, anything curved found in your home. 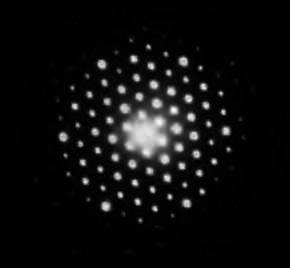 Here is another form of exterior diffraction, the results graphed by Dr Olsen in the 1930's of sound bouncing off an object. In this first case the shape is a Cylinder. As suspected, the Cylinder shows the same strong resonance patterns shown above. The acoustic reflections of a Cube. Bad as the cylinder, and naturally worse at some angles. And here we have the sphere. Notice how it actually has a smoothing effect, in fact spheres have been hung in the Hollywood Bowl (see below) as acoustic correction devices. Talk about room treatment! These graphs do not describe the further benefits of internal diffraction reduction caused by focusing the internal sound waves into the center of the enclosure and also into the rings of Sound Diffraction found along the interior surface of the enclosure. 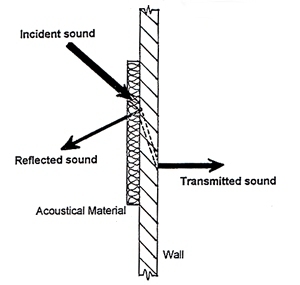 Both effects cause far less time-delayed sound-bleed through the speaker cones-- which destroys sound-quality in the listening area outside the loudspeaker system. 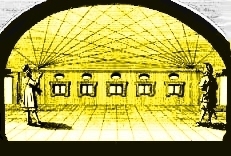 Using sound-absorbents can reduce reflections by 20db maximum. Proper curved internal wall design can reduce the internal reflections by close to 100%. These effects are not on these charts. Compensation via electronics or Loudspeaker driver placement/aiming can only create a rough equivalent of the benefit of using curved loudspeaker enclosure shapes because the sound-spectrum bandwidth is far too wide for quality non-enclosure compensation. 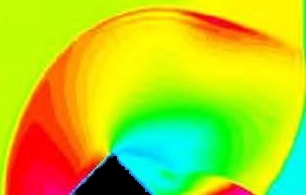 Curving The Loudspeaker Enclosure Design Eliminates a large number of variables when designing mass-manufactured loudspeakers including the calculus involved with baffle-step diffraction. Our ultimate enclosure shape-materials have the ability to eliminate baffle-step diffraction and thus literally lessen the work and cost involved with designing a proper loudspeaker system; it allows previous engineering efforts to be easily modified to create both Stellar - Sounding and Looking products- at a far lower percentage of your current Engineering, Manufacturing and Driver costs. 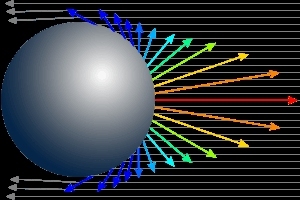 Our SHAPES reduce exterior diffraction and also reduce the additional smeared sound-quality even the highest costing loudspeakers have which are caused by internal reflections which travel through the loudspeaker cone... up to dozens of milliseconds after the sound was originally reproduced by the drivers... both distorting the cone motion and also propagating unwanted reflective sound even with near field monitors. No electronics can hide the internal effects nor can any stuffing reduce internal sound even 30 db let alone the 140 db found inside loudspeaker enclosures. Our shapes and our materials together are literally The most technologically advanced Loudspeaker Enclosures available. They simply improve loudspeaker sound quality in a way no electronics can at a cost lower than your existing loudspeaker enclosure costs and with higher visual quality. Our product materials create a true breakthrough in loudspeaker technology. 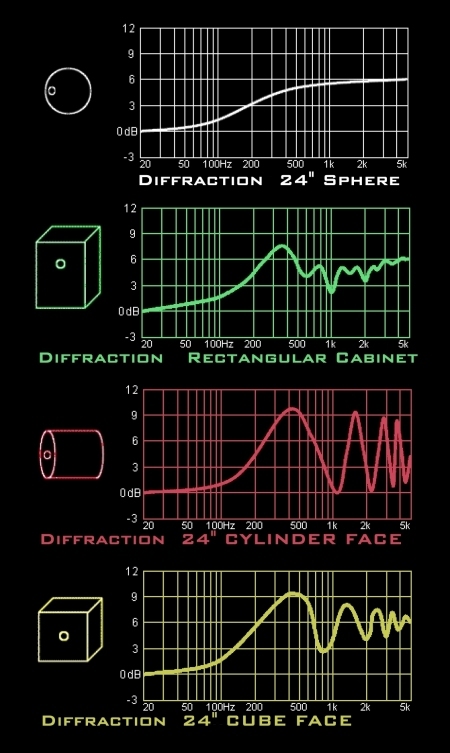 Defeatable Internal Diffraction in a curved loudspeaker cabinet. 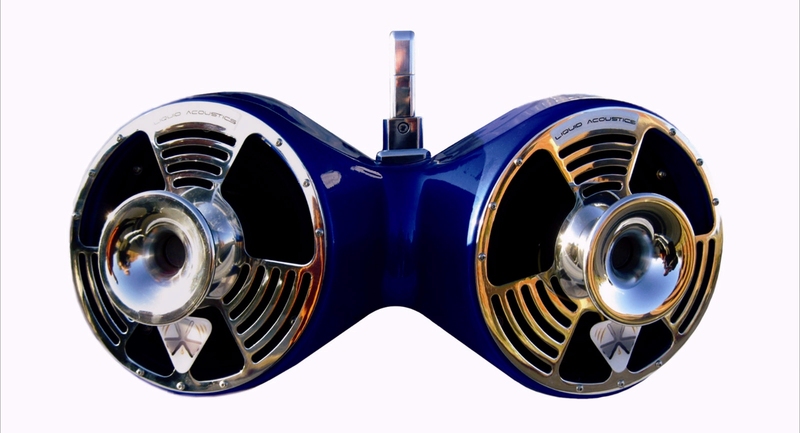 US Enclosure’s Technology can add tremendous value to a given OEM loudspeaker system. This is accomplished by Smoothing and Widening the response. SMOOTHING-- Lower exterior wall diffraction smooths and sweetens the response. Even the best existing electronics can only crudely simulate this effect. Less diffraction from exterior walls also lowers the delays created from sharp enclosure corners. Our loudspeaker enclosure shapes also create far less diffraction from the enclosure's interior walls. The benefit is far less sound-pressure induced loudspeaker cone bleed-through of time delayed time-delayed sound from the loudspeaker into the listening area. WIDENING-- Lower exterior cabinet surface diffraction from the causes soundstage widening. Diffraction. 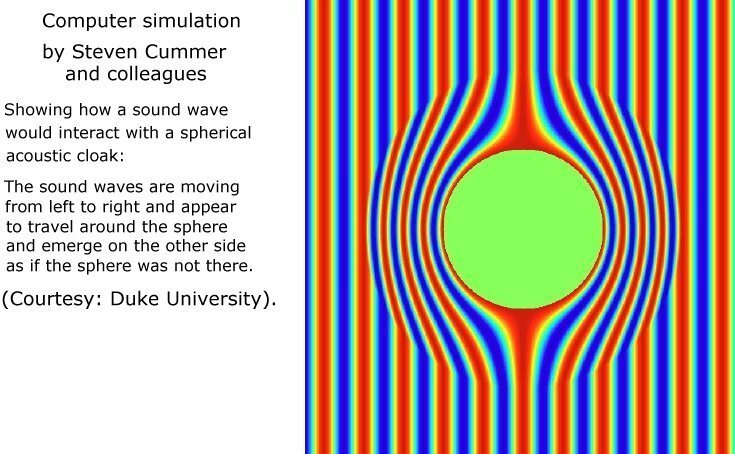 All waves diffract no matter their frequency. As an example, review diffraction using light waves. 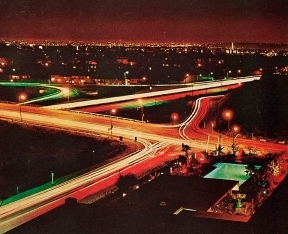 When a yellow light wave diffracts, it slows and turns orange. 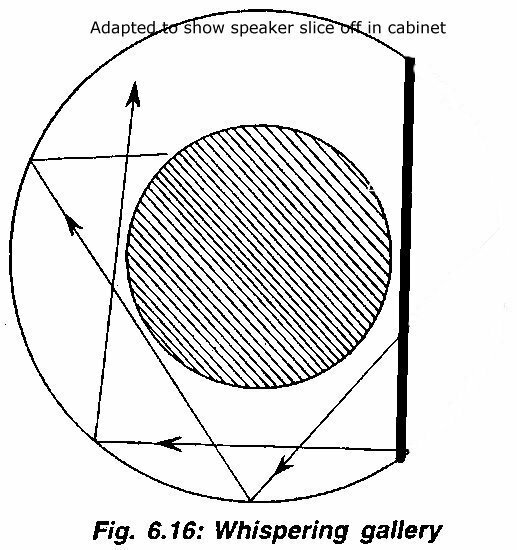 The exact same thing occurs when a sound wave slows after encountering a loudspeaker box corner... corners found either on the inside of the box or on the outside of the box-shape loudspeaker enclosure. The sound changes from it's original quality. And this is unacceptable now that curved loudspeaker enclosures can be manufactured that look as good or better than existing box-shaped loudspeaker enclosures and with the same manufacturing costs than box-shaped loudspeaker enclosures. The mix of "yellow" & "orange" sound causes loudspeaker enclosures to negatively "color" it's sound. OUR BENEFIT: Your drivers will sound more expensive when this coloration is ( in practical-terms ) "eliminated" from the product's sound field. And we can provide these benefits to your company at the same or lower cost than you currently are paying for box-shaped cabinets. Our Design Division has a long-term proven success record when your design engineers request additional assistance. Manufacturers using either electronic or other diffraction-compensation systems still have the reality that their compensation system has to properly handle a 20 - 60 hz to 8 - 10 khz wide bandwidth in real-time and the compensated sound then still travels past both external and INTERNAL corners-- causing time-delayed bleed through the driver cones from internal diffraction & phase-shifts from exterior cabinet corners as external diffraction.